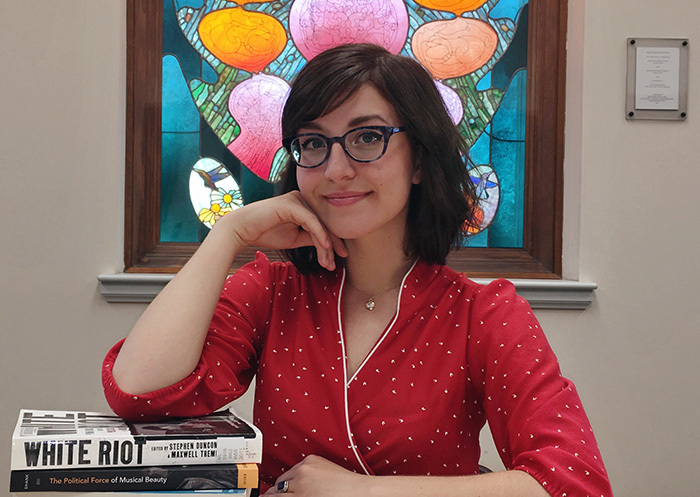 Patti Kotrady ’16 is a punk-rock bassist and history buff who turns a scholarly eye on music and social history. She talks about what it was like to conduct oral-history research in South Africa, her passion for education and her senior thesis in American studies, investigating do-it-yourself culture in the Philadelphia punk scene. American studies (minors in education and women’s & gender studies). I am also in the process of receiving Pennsylvania state certification to teach secondary social studies. Kappa Delta Pi education honor society, Feminist Collective and education department (student assistant). Lenfest Foundation scholar and John Montgomery Leadership Scholar. In August 2015 I traveled to King William’s Town, South Africa, through a Dickinson Mosaic on race and education. We conducted interviews with students, teachers and administrators involved in the South African school system, focusing on educational injustices and the effects of apartheid on modern South African life. The highlight of my experience was staying with a host family. I became very close with my host sisters, watching South African reality TV, exploring the town and generally talking about our lives as young people. I still keep in contact with them through social media. Originally, I was double-majoring in psychology and women’s & gender studies, but after a summer working as an instructional assistant for fifth graders with behavioral and emotional exceptionalities, I realized that teaching young people social studies was my calling. After taking an Introduction to American Studies course with [Associate] Professor [of American Studies] Cotten Seiler, I realized that American studies was the perfect major for me. As someone who wanted to major in everything, the interdisciplinary nature of American studies felt like a blessing. It’s about using history, literature and even popular culture texts to understand the major issues in our world. I also love its social-justice orientation, its focus on marginalized narratives and the way it uses history as a lens to understand the present. American studies scholars often approach history in a radical way, with a focus on the under-researched or “hidden” histories of our world. Feminist Theory: From Margin to Center by bell hooks. It totally changed the way I view feminism. Heima (a documentary film about the Icelandic band Sigur Rós). It beautifully depicts the landscape of Iceland by showing the band playing in fields, old factories and caves. Dickinson was one of my top choices. I was attracted to the small class sizes, international focus and student-professor relationships. I also like that Dickinson does not require SAT test scores (even though I did fine on my SATs), because to me, that makes an important statement about the increased emphasis on standardized testing in America instead of on communication, writing and service. Additionally, Dickinson offered me the best financial aid package. Since I am paying for the majority of my college experience on my own, this was very important to me. A leather couch in the “fishbowl” section of the library (with the large windows). This is where I do most of my reading. I plan to become a secondary social studies teacher. It is one of my goals to empower youth, and I believe that providing an inclusive, meaningful education in social studies is an ideal way to nurture critical thinking, self-empowerment and social change. I want to make an impact on students and get them excited about the joys of learning in an increasingly informational age. I want to teach students the current and historical ways of our world so that young people can become more engaged participants in democracy. I sing and play bass guitar in a band called Lilac Daze based out of Frederick, Md. I often travel to play shows on the weekends in major cities in the area, including Baltimore, Philadelphia and Washington, D.C., even touring around the East Coast to play shows during breaks. I interned at Dickinson’s Women’s and Gender Resource Center during my first year here, because I knew I wanted to get involved in social justice and I knew I wanted to study women's & gender studies. Through this internship, I gained skills in organizing and planning events with a social-justice focus, such as Take Back the Night, a Ladies’ Night discussion group, faculty research lunches at Landis House and Love Your Body Week. I also maintained the Women’s and Gender Resource Center library, created promotional materials and completed daily office tasks. These experiences helped me understand how to apply my passions and classroom knowledge in a professional environment. … Lou Reed. His involvement in the band The Velvet Underground has inspired me in so many ways. I would also love to talk to him about my thesis research and get his perspective on the New York City music scene of the 1960s and 70s. For my American studies senior research project, I researched current punk rock subcultures in Philadelphia, a flourishing music site. I researched and interviewed major players in the Philadelphia music scene, with a focus on the do-it-yourself ethic in punk rock, which centralizes self-reliance and music production without the help of a paid professional. I outline punk’s perceived historical roots and highlight its movement to the city of Philadelphia shortly after its rise in New York City and England and its eventual popularization and perceived adaptation into the mainstream in the 1990s and early 2000s. I argue that contemporary punks, such as those in Philadelphia, are trying to bring back punk’s exclusivity through a music scene characterized by live concerts held in basements of independently run “punk houses," typically situated in economically deprived family neighborhoods. This network of punk houses provides a place where punks can engage in a form of unregulated cultural capital exchange through booking, attending and/or playing shows. I conclude with an assessment of the Philadelphia DIY punk scene’s sustainability, specifically critiquing its role in the gentrification of the city. Growing up as a young person in rural Pennsylvania, punk music seemed to provide me with everything I felt I needed—it fostered creativity, vocalized teenage angst and, above all, provided a community of outcasts that I could relate to outside the context of my small hometown. As a young teen, I listened to music and attended shows on the weekends, often convincing my friends to drive me to Baltimore and Washington, D.C., to watch my favorite bands perform. As I grew older, started my own band and took American studies classes at Dickinson, I began to reconsider my experiences and ask questions about what I witnessed: What does it mean for someone to be “punk"? Is punk just a genre of music in opposition to mainstream popular culture, or is it a lifestyle? What specific, yet often unspoken, “rules” or etiquette of the subculture work to construct these politics of punk identity? I decided to take an analysis of punk music subcultures into my own hands by conducting interviews with key players in Philadelphia. I’ve learned how to take initiative conducting research and act on the gaps I see in scholarship. I’ve learned how to think critically about everything around me and how to apply cultural theory to everyday life, as evidenced through my use of Pierre Bourdieu’s theories in my work. (Bourdieu theorizes with a focus on 19th-century French art and literature, but I have learned to apply the same concepts to something like DIY punk.) I’ve also learned how much I love the research process and how I want to keep pursuing personal research after I graduate from Dickinson.